1.Thaw the required amount of whipping cream in the refrigerator. Freeze the whipping blades and bowl. Boil milk and let it cool. In a mixing bowl, add milk, milk powder, GMS powder and CMC powder. 2. Gently mix well without any lumps with a whisker. Now, boil the milk mixture. When it comes to a boil, put in low heat or simmer for 5 minutes. Turn off. Let the milk mixture cool to room temperature. Once cooled, strain the milk mixture through a strainer. Set the milk mixture in a freezer box in the freezer until slightly firm. 3. In the freezed mixing bowl, add the thawed whipping cream, vanilla essence and whip for few minutes until it starts to thicken. 4. Add the milk mixture and whisk well. Keep whisking until the volume of doubles. Transfer to a freezer box and freeze it till it sets. Yummy Vanilla Ice Cream is ready...scoop out and enjoy with your favourite topping!!!! The GMS and CMC powders are stabilisers for the Ice Creams. You can also replace this with 1/2 tbsp of instant stabilizer. You can skip it completely if you do not want. Use a big mixing bowl as the mixture doubles itself on whisking. The essence can be replaced to other essences like butterscotch for that flavours. It is more like a base ice cream recipe. Reduce the recipe by half for a small family. This served more than 1 liter. You can also whisk again the freezed ice and then refreeze it. It adds more taste and gives good texture. 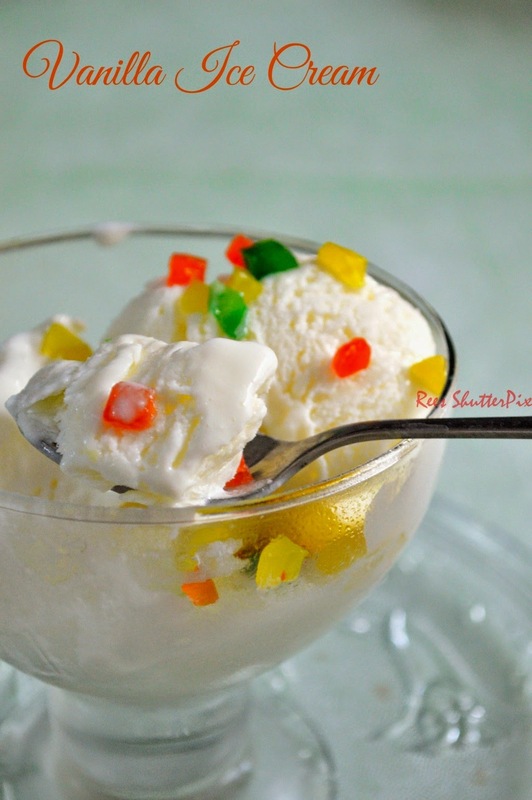 Serving Suggestion: A scoop of Vanilla Ice Cream with Tutti Frutti. Looks super delicious dear! I'm sure your husband enjoyed a lot! Turns out perfect and super delicious.. I was about to ask you gmc and other powder ..Clear detailed step by step pics sooriya ..Here we are in no mood to east icecreams..Will be trying in summer time . 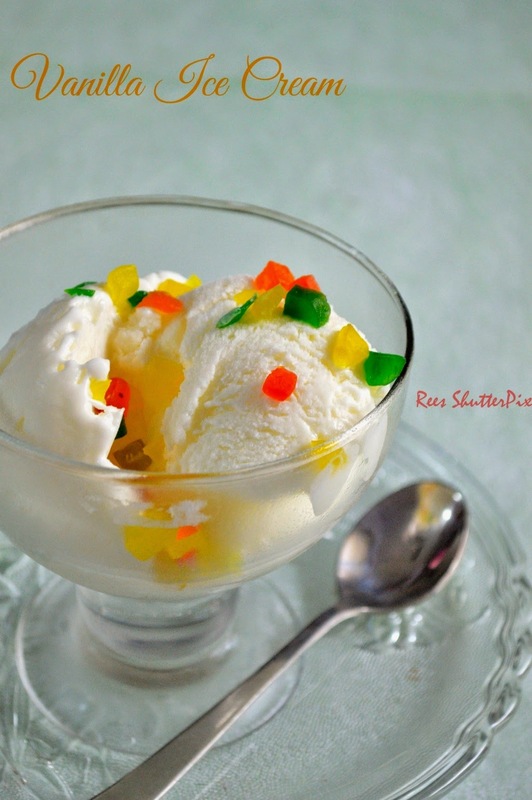 The ice cream looks so professional, superb..